HOLLYWOOD—Gone are the days of celebrities being hired for product endorsements as well as speaking engagements. Now, due to the popularity of YouTube, beauty gurus are influencing women, teens and tweens with their opinion on products or purchase decisions. 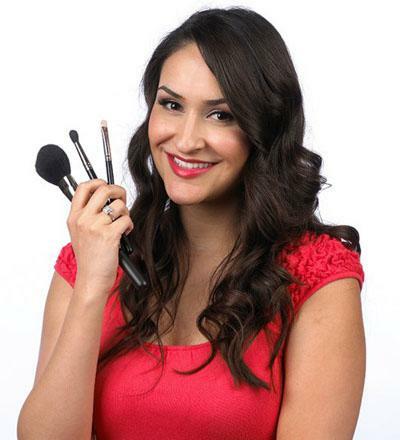 Beauty gurus love cosmetics and they both go hand-in-hand. With that said, we just had to go to IMATS, the make-up world’s biggest gathering on April 14 and 15. It all began in 1997 in Los Angeles, when Make-up Artist Michael Key held his first IMATS in Los Angeles. Multiple Emmy-Award winning make-up artist Kevin James Bennett is always a pleasure. His knowledge, expertise and techniques is refreshing. One of the other highlights of the show was Beauty Guru and featured speaker Kandee Johnson. Miss Johnson is a You Tube sensation that has over 100 million views on her videos, She runs her beauty blog in between taking care of her four children. She spoke for about 45 minutes then did a Q & A for about fifteen minutes and followed up by a meet and greet. The vibrant young mother loves to inspire her subscribers by giving great advice and beauty tips to teens. Another beauty guru that was there was Julie G, known by only her first initial of her last name. Julie is always a hit with her subscribers, due to her charming and bubbly personality. Julie currently has her own nail polish line with Jesse’s Girl Cosmetics. Her beautiful nail colors are neutral, vibrant and quite eye-catching. Simply put, beautiful. The event was full of quality, and it successfully resonated with the audience of an estimated 3,000 people who were present for the weekend event. It just seems that IMATS keeps growing year after year. Michael Key, the show’s director, spared no expense and really excelled in making IMATS, New York the make-up world’s biggest weekend. The Afterglow, the post-show party was magnificent, with scenic views of New York City. The elite business people were all present at the AVA Lounge in the Penthouse and Rooftop bar of the DREAM Hotel bringing a relaxing setting to a beautiful night. Rose’s Scoop: Hollywood celebrities came together to join Robert De Niro kick off the 11th annual Tribeca Film Festival at the Vanity Fair Party on April 17. Michael Douglas and his beautiful wife Catherine-Zeta Jones, Michael Douglas and wife stayed about 30 minutes and then left the party. Katie Couric, Billy Crystal, Gayle King, Judge Judy and New York Post Cindy Adams were also in attendance, among many others.